Square or circular shower drains for domestic tiled, vinyl and concrete floors. Available with optional removable water trap and filter basket. Square frame for resin/ tiled/ concrete flooring, or round frame for vinyl flooring. Vertical or horizontal 50, 75 or 110 mm diameter outlet. Suitable for floors with a liquid waterproofing membrane, sheet waterproofing membrane or no waterproofing membrane. Designed in accordance with BS EN 1253. Flow capacities up to 1.8 L/s. Brushed grain finish 8 mm holes, standard pattern. Trap and filter basket are removable for cleaning and maintenance. Grate with starlock screw-system, available in three shapes and six designs. Manufactured from stainless steel grade 1.4301 (AISI 304) as standard, 1.4404 (AISI 316L) is also available. Toilets and showers in hotels, hospitals and fitness centres. Clamping ring (for vinyl flooring). Water trap (two part, removable). Flange (for flooring with a waterproofing membrane). Lower part with or without side inlets. Watertrap: Stainless steel 1.4404 (AISI 316). To specify 1.4404 (AISI 316L), rather than 1.4301 (AISI 304), suffix S to the part number, e.g. 110.300.050 S. Consult manufacturer for details. 110.300.050: Adjustable square shower drain; frame: 145 x 145 mm; outlet: 50 mm diameter - horizontal; material: stainless steel. 110.300.075: Adjustable square shower drain; frame: 145 x 145 mm; outlet: 75 mm diameter - horizontal; material: stainless steel. 150.300.050: Adjustable square shower drain; frame: 145 x 145 mm; outlet: 50 mm diameter - vertical; material: stainless steel. 150.300.075: Adjustable square shower drain; frame: 145 x 145 mm; outlet: 75 mm diameter - vertical; material: stainless steel. 150.300.110: Adjustable square shower drain; frame: 145 x 145 mm; outlet: 110 mm diameter - vertical; material: stainless steel. 160.300.050: Square shower drain; frame: 145 x 145 mm; outlet: 50 mm diameter - horizontal; material: stainless steel. 160.300.075: Square shower drain; frame: 145 x 145 mm; outlet: 75 mm diameter - horizontal; material: stainless steel. 160.300.110: Square shower drain; frame: 145 x 145 mm; outlet: 110 mm diameter - horizontal; material: stainless steel. 210.300.050: Adjustable shower drain circle; grating: 155 mm diameter; outlet: 50 mm diameter - horizontal; material: stainless steel. 210.300.075: Adjustable shower drain circle; grating: 155 mm diameter; outlet: 75 mm diameter - horizontal; material: stainless steel. 250.300.050: Adjustable shower drain circle; grating: 155 mm diameter; outlet: 50 mm diameter - vertical; material: stainless steel. 250.300.075: Adjustable shower drain circle; grating: 155 mm diameter; outlet: 75 mm diameter - vertical; material: stainless steel. 250.300.110: Adjustable shower drain circle; grating: 155 mm diameter; outlet: 110 mm diameter - vertical; material: stainless steel. 260.300.050: Shower drain circle; grating: 155 mm diameter; outlet: 50 mm diameter - vertical; material: stainless steel. 260.300.075: Shower drain circle; grating: 155 mm diameter; outlet: 75 mm diameter - vertical; material: stainless steel. 260.300.110: Shower drain circle; grating: 155 mm diameter; outlet: 110 mm diameter - vertical; material: stainless steel. 310.300.050: Adjustable square shower drain; floor: concrete, resin and tiled - liquid membrane; frame: 145 x 145 mm; outlet: 50 mm diameter - horizontal; material: stainless steel. 310.300.075: Adjustable square shower drain; floor: concrete, resin and tiled - liquid membrane; frame: 145 x 145 mm; outlet: 75 mm diameter - horizontal; material: stainless steel. 312.300.075: Adjustable square shower drain; floor: concrete, resin and tiled - sheet membrane; frame: 145 x 145 mm; outlet: 75 mm diameter - horizontal; material: stainless steel. 350.300.050: Adjustable square shower drain; floor: concrete, resin and tiled - liquid membrane; frame: 145 x 145 mm; outlet: 50 mm diameter - vertical; material: stainless steel. 350.300.075: Adjustable square shower drain; floor: concrete, resin and tiled - liquid membrane; frame: 145 x 145 mm; outlet: 75 mm diameter - vertical; material: stainless steel. 350.300.110: Adjustable square shower drain; floor: concrete, resin and tiled - liquid membrane; frame: 145 x 145 mm; outlet: 110 mm diameter - vertical; material: stainless steel. 352.300.075: Adjustable square shower drain; floor: concrete, resin and tiled - sheet membrane; frame: 145 x 145 mm; outlet: 75 mm diameter - vertical; material: stainless steel. 352.300.110: Adjustable square shower drain; floor: concrete, resin and tiled - sheet membrane; frame: 145 x 145 mm; outlet: 110 mm diameter - vertical; material: stainless steel. 360.300.050: Adjustable square shower drain; floor: concrete, resin and tiled - liquid membrane; frame: 145 x 145 mm; outlet: 50 mm diameter - vertical; material: stainless steel. 360.300.075: Adjustable square shower drain; floor: concrete, resin and tiled - liquid membrane; frame: 145 x 145 mm; outlet: 75 mm diameter - vertical; material: stainless steel. 360.300.110: Adjustable square shower drain; floor: concrete, resin and tiled - liquid membrane; frame: 145 x 145 mm; outlet: 110 mm diameter - vertical; material: stainless steel. VIENNA grating is included as standard. Other grating is available to order. Consult manufacturer for details. 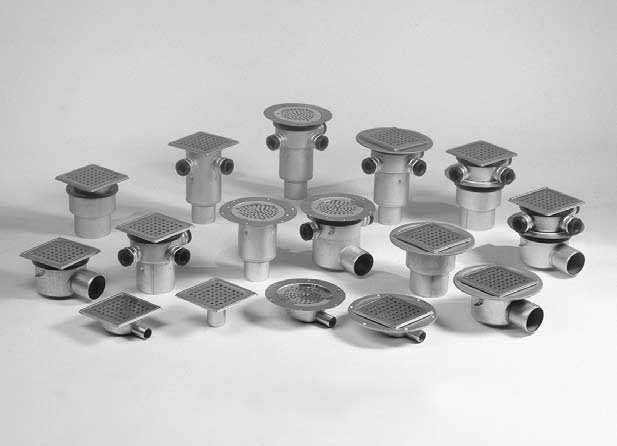 Filter basket; material: stainless steel grade 1.4404 (AISI 316L).